To commemorate the anniversary of the Battle of Franklin, 10,000 luminaries, representing the casualties of the battle, will be lit at dusk. This event is free to the public. Location: Carnton Plantation. 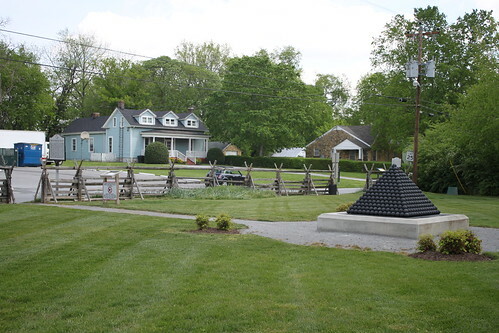 One of the must-stops in Franklin for a battlefield site is Cleburne Park. It sits at the corner of Stewart Street and Columbia Pike, just a few blocks south of the Carter House. This small park is the approximate location where Major-General Patrick R. Cleburne was killed. It was formerly the site for a Pizza Hut until the land was preserved and returned to a park-like setting. The land reclamation project made national news, even in National Geographic. You can watch a YouTube video of Eric Jacobson talking about this hallowed spot. 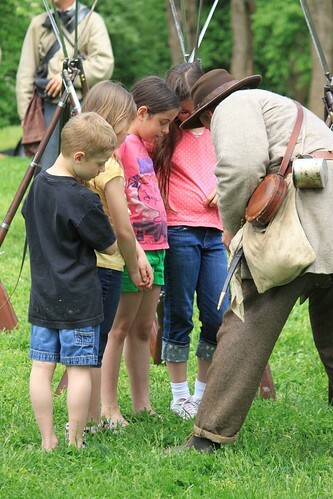 The ceremony today was filled with many sights and sounds, including dignataries, out of town guests, reenactors (both soldiers and civilians, children, residents; fans-all of the Battle of Franklin. To see all of the pictures I took today visit my Flickr photo gallery. 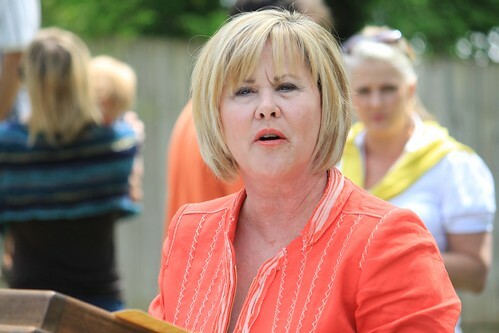 Battle of Franklin Trust chairman Marianne Schroer spoke first. Civil War Preservation Trust staff person Rob Shenk gave a few opening remarks. Historian and resident-story teller Thomas Cartwright was his usual inspiring self. Historian and Battle of Franklin Trust operations director Eric Jacobson shared appropriate words for the occasion. 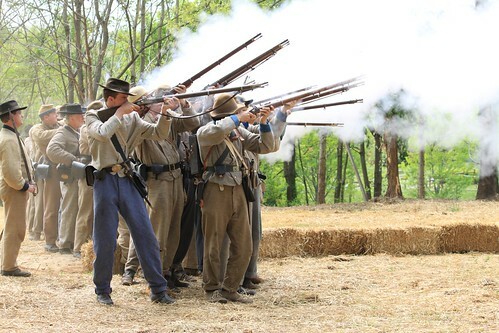 After the ceremony the Rebs and Federals provided a demonstration of the action in the Carter gardens. I took over 130 photos today at the Carter garden ceremony. Here are some highlights of today’s ceremony. To access the complete photo gallery click here. 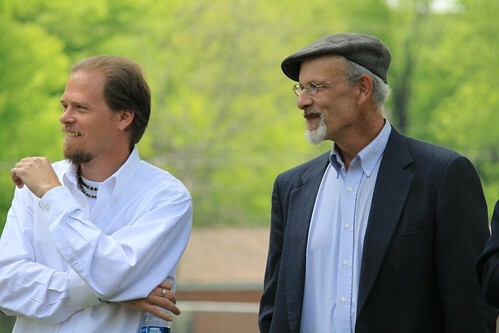 Historian-friends Eric Jacobson and Thomas Cartwright. 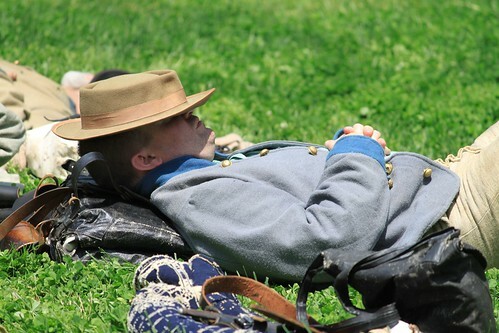 Nothing like a good snooze in the shine for a Rebel. Federals armed with repeaters reenact in the likeness of the 72nd Illinois. The Rebs pour fire into the Yankee line. 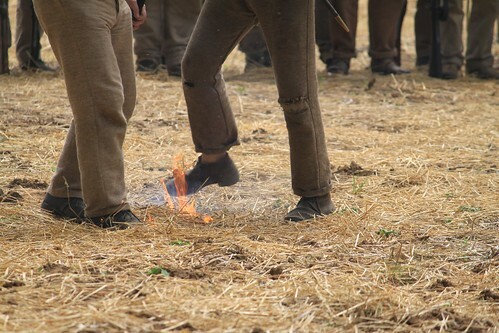 Unfortunately, the Rebs also created fire on the hay in the gardens too. This Yankee-lad is a direct descendant of Capt James Sexton, 72nd Illinois. 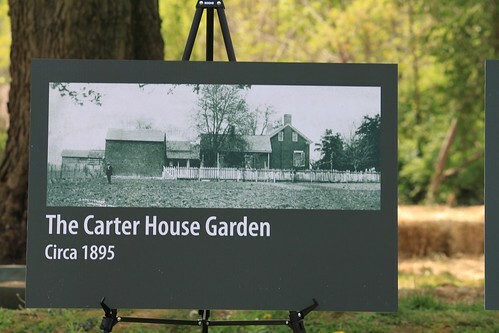 The newly reclaimed Carter gardens was once a significant part of the Carter family property. 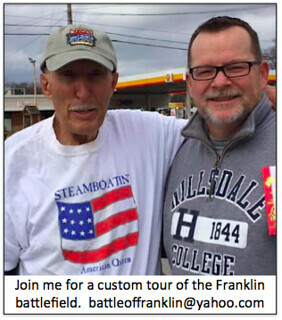 It's the 'next generation' who will have to carry the torch for preservation for the Franklin community. To access the complete photo gallery click here. Released April 14th, 12:30 p.m., CST. 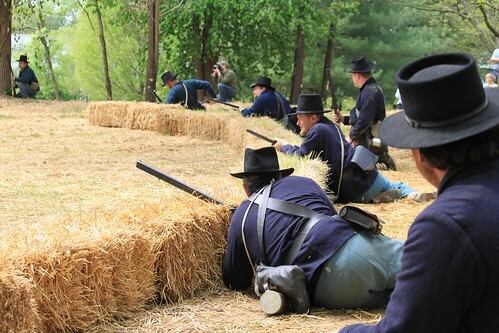 The Franklin (TN) Civil War preservation community continues to have much to celebrate when it comes to reclaiming hallowed ground, land that played a crucial role during the American Civil War (1861-1865) . 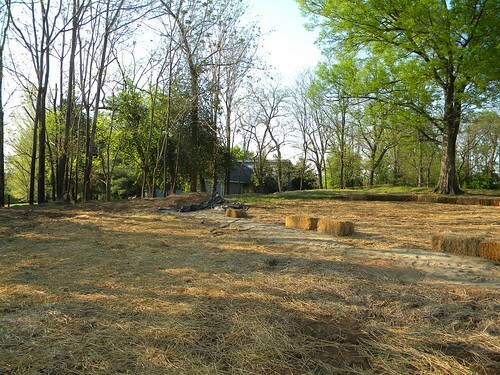 In 2007, in partnership with the Civil War Preservation Trust (CWPT), a small portion (i.e., one-half acre) of the original Carter family garden was purchased for future posterity and remembrance of the horrific action that took place just 50 feet south of the present Carter House grounds. The half acre of land cost $210,000.00. The Battle of Franklin Trust, which stewards the Carter House grounds property, is hosting a dedication ceremony this Saturday at the site. The Federal or Union defensive line (in discussion here) lay basically across an East-West diagonal line on the western side of Columbia Pike, just 50-60 feet in front of the present day Carter grounds. That line was an entrenchment that was dug by Union soldiers probably in the early morning hours of November 30th, 1864. 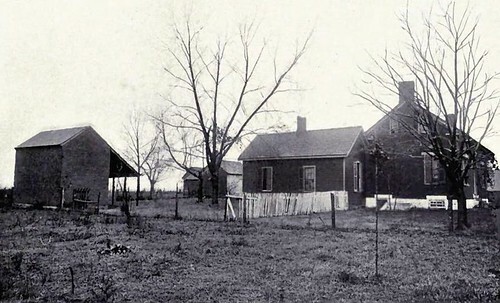 The Carter family had a small family vegetable garden that is believed to have originally been a two acre parcel of land, about 50 feet south west of where the slave cabin is presently located. Many Union soldiers’ letters and diaries record men having spent several hours the morning of the 30th hastily and hurriedly digging trench works along this line. This defensive line, also known as earthworks, or breastworks, was a significant reason why the Union side at Franklin saw modest casualties-killed (about 150), while the Confederates suffered a staggering amount, (around 1,700), according to Fred Prouty. Historian Eric Jacobson says those numbers are probably even too low. He believes there were probably 300 Federal killed at Franklin. An army that fought behind defensive earthworks had a distinct advantage against assaulting troops, especially if the defending army also had artillery support. The Union armies at the Battle of Franklin had the advantage of both. Thus, as Jacobson says (p. 374 below), the ” . . . cards were stacked against them [the Rebels] almost from the start”. Ewing said it well, the Confederates at Franklin “got whipped”, and the biggest reason was because of the defensive earthworks. 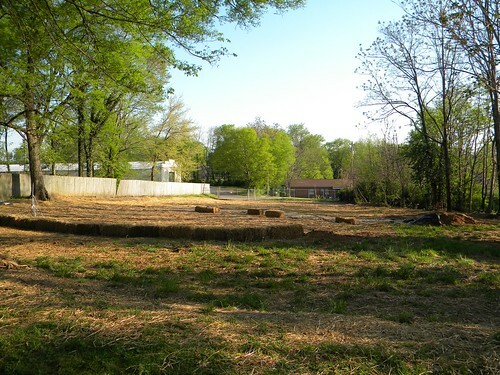 The Tennessee Wars Commission provided the grant to Franklin’s Charge for the excavation of the Carter garden area. 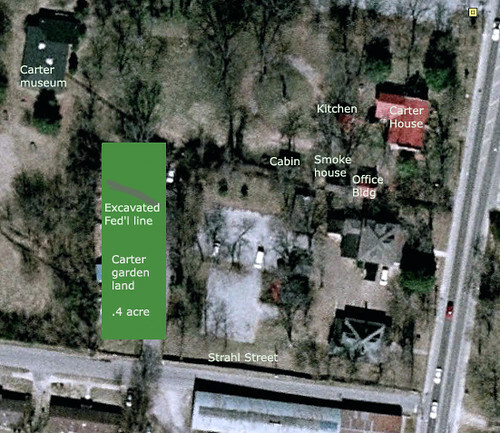 An archaeological team led by Larry McKee – with TRC Garrow Associates Inc. – found material evidence of that awful day, unearthed just several inches below the surface in the present-day Carter garden. Jacobson says that the team “excavated about 2/3rds of the Federal line that runs diagonally across the property”. They dug down roughly 20 inches and discovered the material evidence including: lots of bullets (Spencers), some fired and some dropped; ram rods, a bayonet, evidence of a fire pot, and human remains. Among the human remains was “a piece of a skull, a finger, part of an ankle, and portion of femur-leg bone”, according to Fred Prouty. It would be impossible to know for sure if the human remains were Confederate or Union. However, we do know that it would have been Federal soldiers who would have dug the earthworks and originally manned them. They dug down from the surface about 18-24 inches and then piled the dirt up in front of the trench, on the south side of the trench. Soldiers would have then placed head logs, branches, and anything they else they could have found around them (including portions of Carter outbuildings, barns, etc,) on the top of the piled dirt in front. In all, the earthworks would have been roughly five to six feet high, thus giving the Federals a tremendous advantage of protection against the assaulting Confederate troops. View probably just 20 feet northeast of the original Carter garden location. 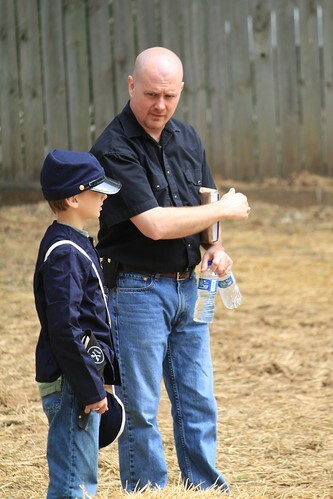 The Federals also had the advantage of artillery placed on the line as well as about 50 yards behind the line. As the approaching Rebels came upon the earthworks they faced a terrible blaze of fire from the Federals in this section, some of whom apparently even had Spencer rifles. A Spencer was a ‘repeating rifle’, capable of firing seven .52 cartridges in less than 10 seconds, compared to the standard Enfield rifle that could yield up to three discharges in one minute. 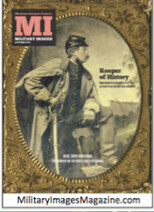 The discovery of the Spencer bullets is interesting as historian Eric Jacobson pointed out. The Illinois troops in that position did not have Spencer rifles. So where did they likely come from? Jacobson thinks they came from the 28th Kentucky Infantry (U.S.) who was posted a mile out front in Wagner’s brigade (U.S.), before the assault started. Wagner’s entire line made for a hasty retreat immediately upon the start of Hood’s charge and skeedaddled back behind the Union line. As the retreating Union soldiers came flying up and over the entrenchments on the Carter garden they no doubt dropped some Spencer bullets, and many also joined the Illinoisians on the line, discharging their rifles against the coming Rebel onslaught. 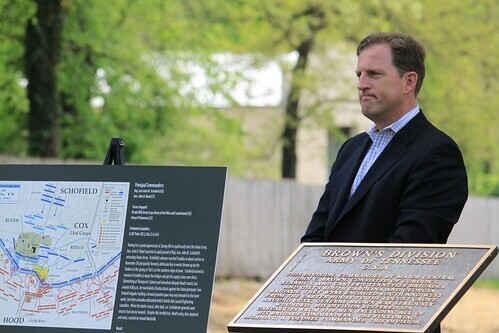 The Battle of Franklin Trust will host a ceremony and dedication this Saturday, April 17th, to formally open the recaptured tract of land that served as the garden for the Carter family. The public is invited to attend this free event which will be held from 1:00 p.m. – 2:00 p.m. Truth is, this hallowed ground — the battlefield at Franklin, like the history of the battle, itself, is our nation’s patrimony. The reclamation of the back portion of the Carter Garden Plot could never have been possible without the passionate work of Thomas Cartwright, the CWPT and a host of individual donors, nation-wide. While it was supported by the many individual preservation organizations in Franklin that make up Franklin’s Charge, along with the collective support from Franklin’s Charge, itself, as we dedicate the garden plot, we are remind, once again that this was a national campaign and its success rests firmly on the shoulders of men and women across the nation. The excavated Federal line is covered with sand. Phone interview 4/13/10; email correspondence; and personal conversations. Also see Jacobson’s For Cause and For Country, 2006 (Hb): pp. 373-74. Fred Prouty, Director of Programs for the TN Wars Commission. Kraig McNutt Civil War Collection, letter(s) from A. Lee Ewing, 63rd Indiana.